Robin began her education at the University of Central Florida (UCF) in 2015. In 2016, she started “graduate school.” She hopes to land her first job within six months. However, Robin isn’t your average student. She is a Canine Companions dog training to become an assistance dog. Raised by UCF student, Morgan, Robin was the first assistance dog in training allowed to live in university housing at a public university in Florida. 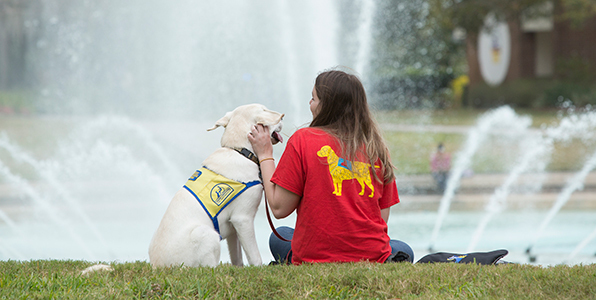 The volunteer puppy raising program offers a unique opportunity for college students to assist Canine Companions with its mission and gain awareness of different types of disabilities. Aside from learning about puppy care and training, students also gain knowledge and experience with learning theory, record keeping and reporting, public speaking and communication skills. Since it's National Volunteer Month, now is the perfect time to learn more about how you can volunteer with Canine Companions. Canine Companions depends on over 3,000 volunteers nationwide every year. During National Volunteer Month, we are celebrating this group of amazing individuals and sharing our gratitude with all our supporters. Thank you! Not yet a volunteer? Get involved today. 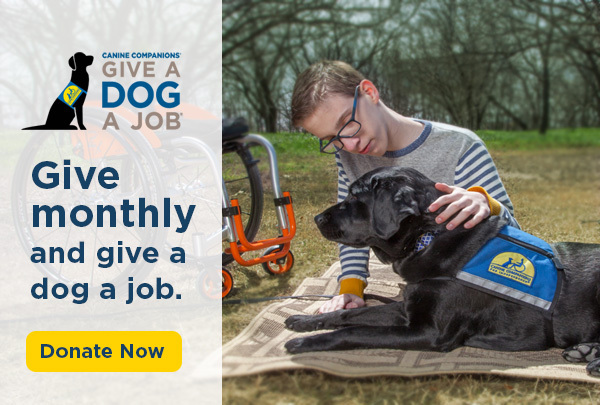 Canine Companions is hoping to win a community grant of $100,000 from the USA Today Network and we need your help! Visit cci.org/USAToday once a day from April 12 through May 12 and vote for our video, “A Service Dog is More Than a Vest.” Vote now! Every Canine Companions supporter has a unique story. How did you get involved? Why do you stay involved? Our supporters are foundational to our ability to provide assistance dogs at no cost to recipients. Do you have a Canine Companions story? Share your story today! Details on our May graduations can be found at cci.org/graduations. Say “Happy Mother’s Day” with a personalized ecard. Free t-shirt with a $40+ or more gift shop order by April 30. Use checkout code 1116 for unisex or 1117 for ladies. DogFest Walk 'n Roll: volunteer, register, change lives. Free eye exams for assistance dogs. See if you qualify here. Pet-friendly La Quinta offers 12% discount - use code CANINE5 when booking. Take me out to the ball game! Puppy Foley goes to opening day.